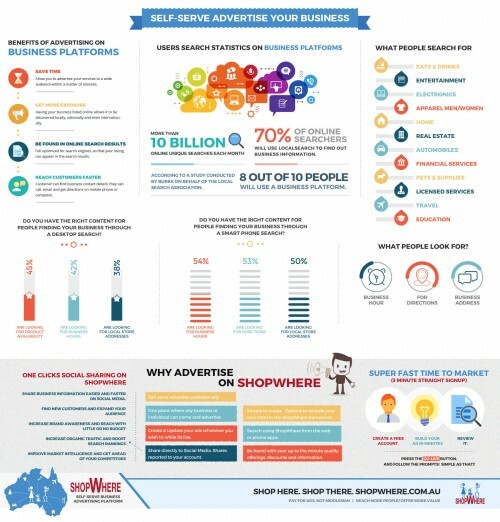 ShopWhere advertising is designed to offertraditional bricks-and-mortar businesses, internet businesses, and licensed professionalsaneffective way to reach customers. ShopWhere advertisements are easy to create, and professional.Multimedia services are offered at an economical rate. Ads are easily shared on multiple social media platforms and web statistics are provided. Advertisements are created, saved, previewed, edited, and can be copied for use as the template for a new one. An advertisement can be paused for a period of time as long as it’s wholly within the advertising term. Businesses can have multiple advertisements live at once, andmanage them all through one ShopWhere account. Advertisements are modifiable to adapt to changing market conditions that may occur during the advertising term.The website and phone apps are location sensitive. For marketing professionals, one ShopWhere account can be used to create and manage advertisements for multiple client businesses. Based in Sydney, the Managing Director and CEO of ShopWhere, Eric Hecht, said, "ShopWhere was developed to bring flexible, efficient, cost effective, shareable advertising to businesses, while making it simple for the public to find what they are looking for in one location. Our hope is that the public viewing an advertisement on ShopWhere, and the businesses that are advertising on ShopWhere, benefit from the ShopWhere website, ShopWhere phone apps, and ShopWhere advertising platform. We look forward to working hard in expanding the benefits of the ShopWhere platform through the use of technology and advertising methods."